I have been on a grilled cheese sandwich kick lately. 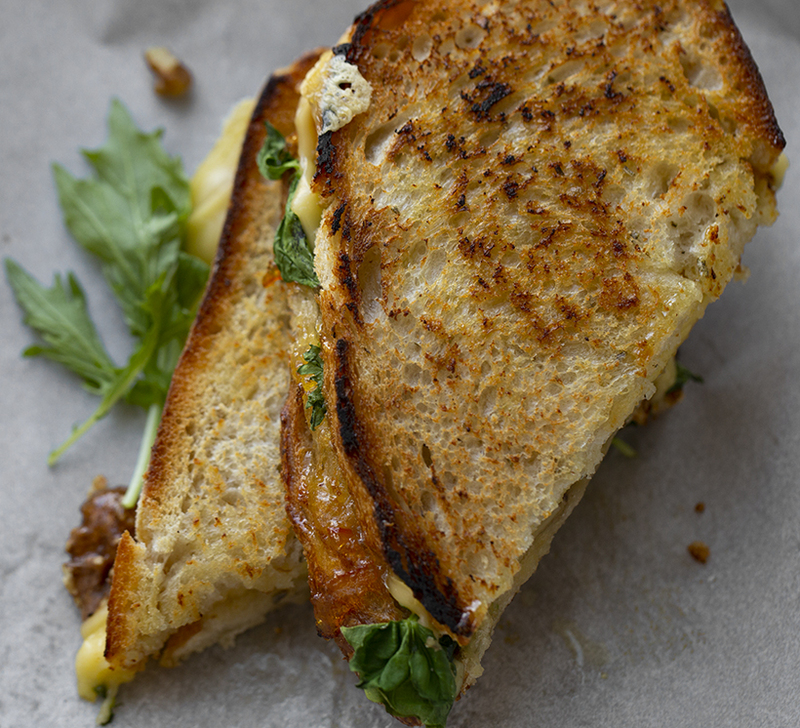 And today's sandwich creation is a new fave: Gouda Marmalade Grilled Cheese Sandwich. 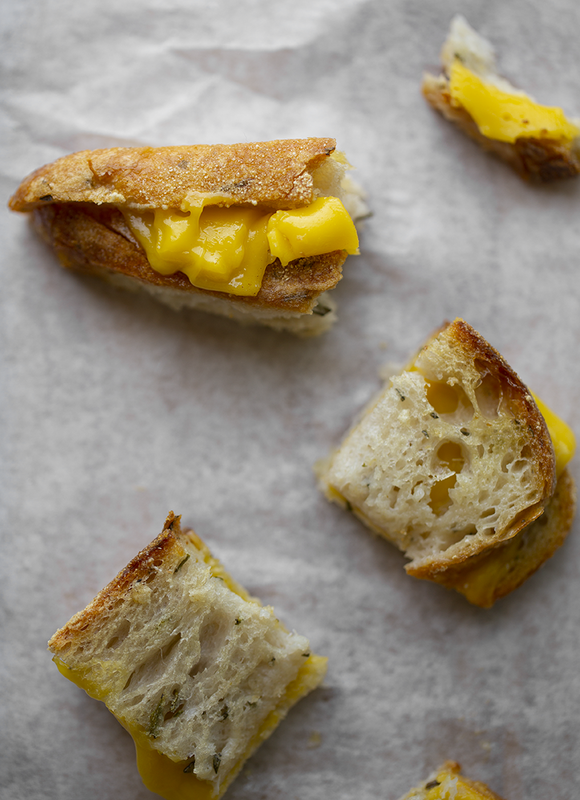 Get the recipe and start your own vegan grilled cheese obsession..
Grilled Cheese. Today's recipe is a winter season dream. 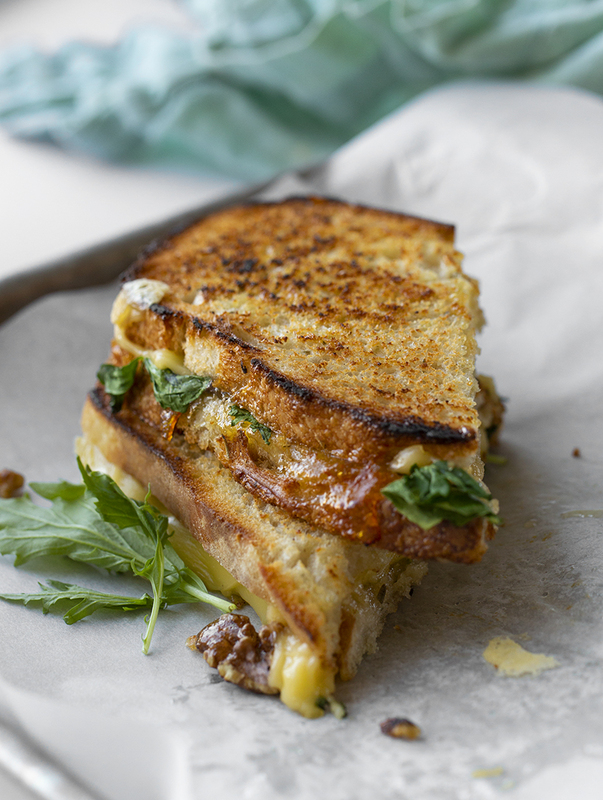 Toasty, buttery, sourdough bread cradles melty Gouda cheese, chopped walnuts, a hint of greens and black pepper and an accent of sticky-sweet marmalade jam. Super simple ingredients with flavors that really pop. - Swap out the marmelade for any jam you'd like. You could even do maple syrup. - Swap out the walnuts for any chopped nut or seed. Spicy pumpkin seeds would be nice. Or chopped pecans. - Add garlic! 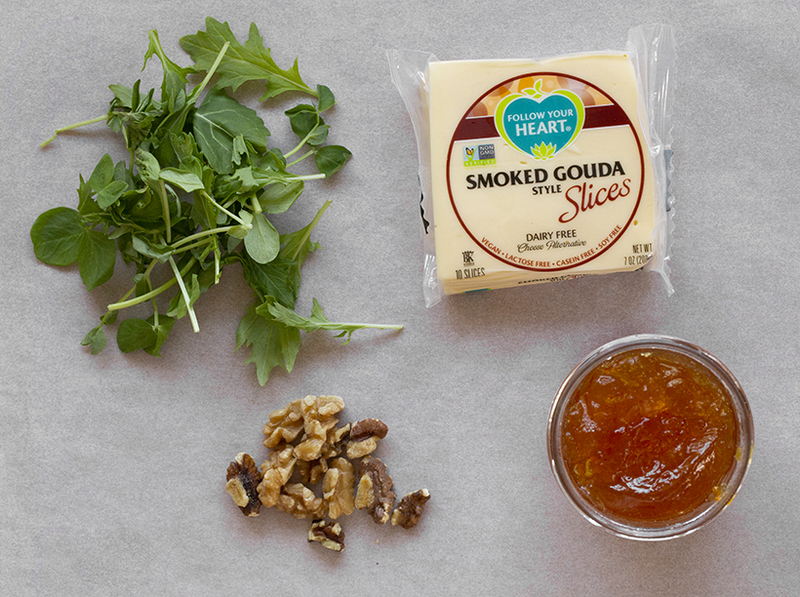 Add minced garlic to your sandwich, or slather on some soft roasted garlic. - Sage. Toasted sage leaves could also be a nice accent. - Black olives. Olives would add another punch of saltiness. - Kale. Wilted chopped kale would be really yummy in this sandwich. Spinach or chard could work too. Any wintery greens to add more flavor, fiber and nutrients. - Hot Sauce. A splash of your fave hot sauce will add a spicy kick! A pinch of cayenne could also work. - Add tempeh bacon or garlic hummus for a boost of legumes. What Vegan Cheese Melt Well? Honestly, there are SO MANY these days that I barely need to answer that question. I used Follow Your Heart for this sandwich, but other faves include: Daiya, Chao, Parmela and So Delicious. Browse my Vegan Cheese Guide for more ideas. 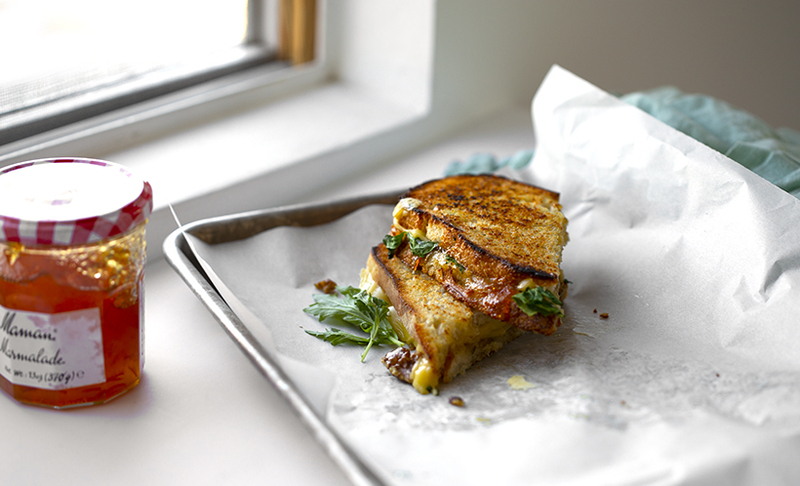 Other fave grilled cheese sandwiches? 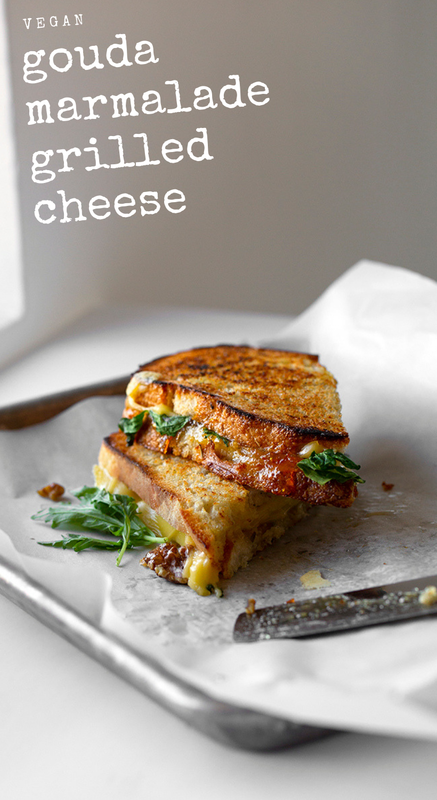 Here are a few..
- I love my spinach-stuffed grilled cheese. 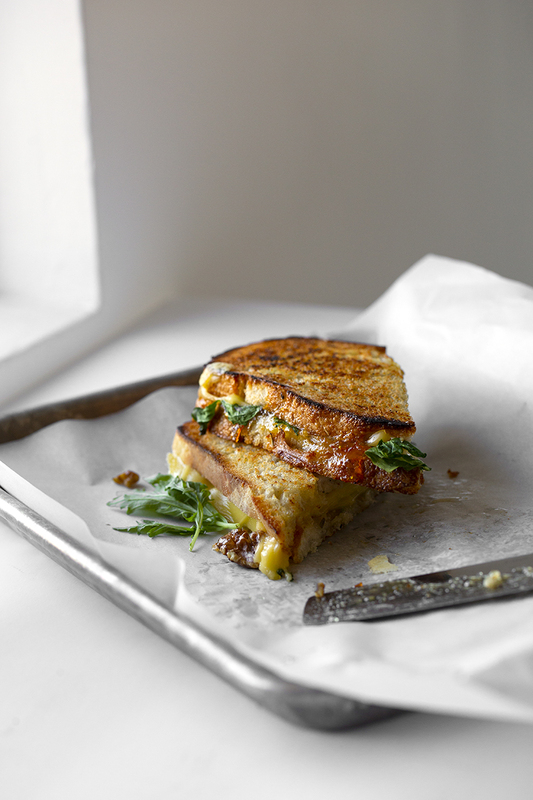 - Classic melty grilled cheese, inspired by the movie Chef. - Apple-stuffed Grilled Cheese on Cinnamon-Raisin Bread. - Also my grilled cheese sandwich bites as tomato soup toppers...! ...aaaaaaand now I have Lady Marmalade stuck in my head. The Xtina + P!ink version. Sing + grill some cheese!.. 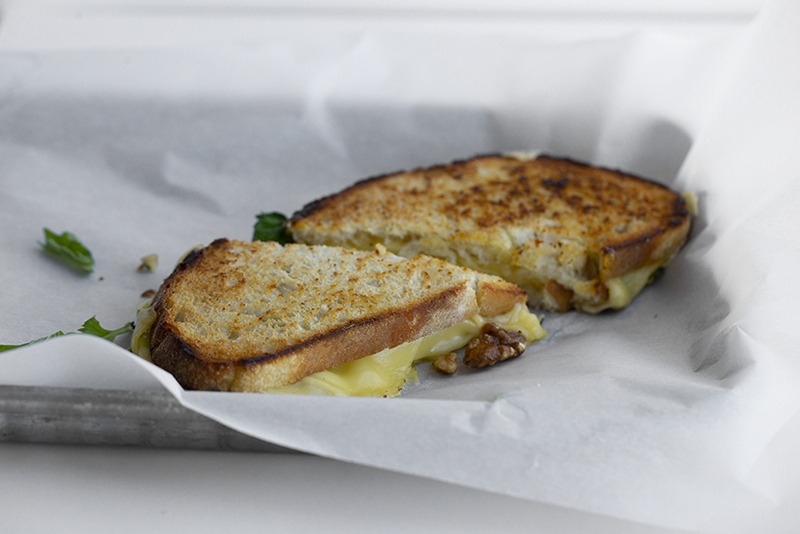 Sticky sweet marmalade pairs with vegan Gouda cheese and chopped walnuts on sourdough bread. Warm a skillet over high heat. Add a splash of olive oil - coating the pan well. Spread the vegan butter on both sides of the bread. 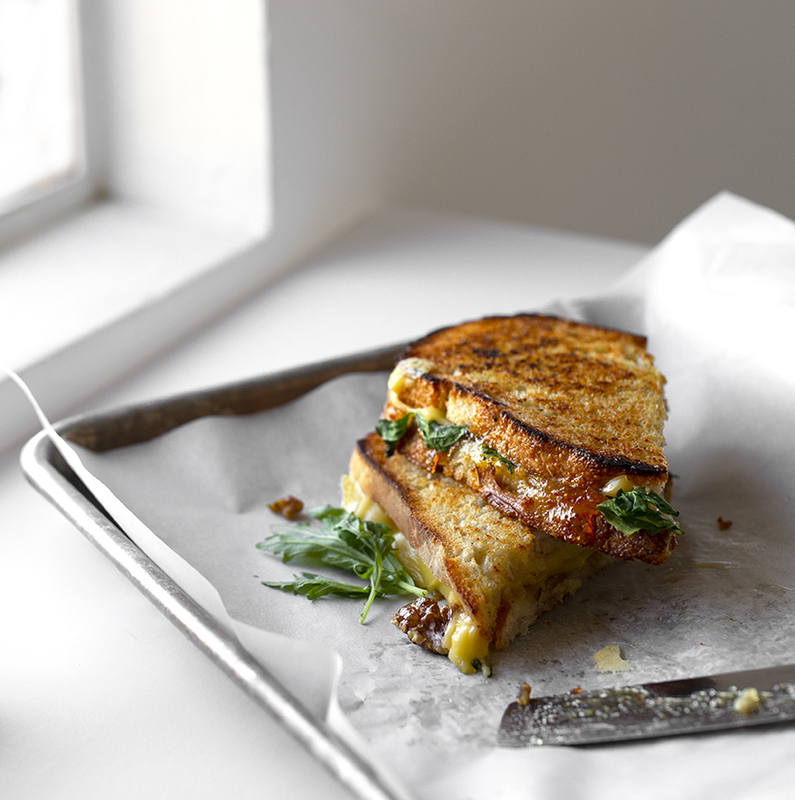 You can use a bit more for a truly buttery-crusted sandwich. Place one slice of the bread in the warm pan, rub it into the hot oil a bit and flip it. Then pile the cheese slices on one side. On the other slice of bread, spread the marmalade. Sprinkle the walnuts over top the cheese slices - in the pan - and then add the greens and black pepper over top. Then top that with the marmalade-slathered slice. Using a spatula or heavy pot top, press down on the sandwich. Turn the heat to low and cover the pan with a lid - or the heavy pot lid. Allow to toast and warm for 2-3 minutes. Flip the sandwich and repeat with pressing down the bread or covering the pan with a lid. The flipped bread side should be lightly browned by now with darker, toasty edges. 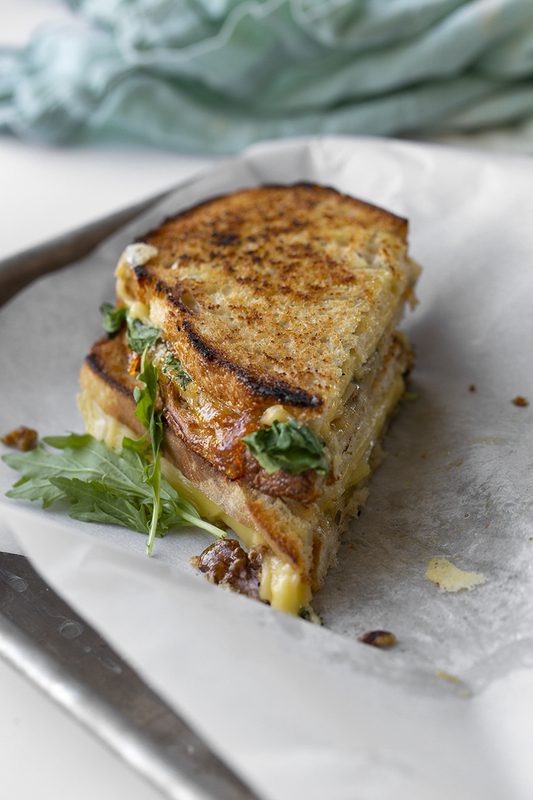 Give the sandwich another 2-3 minutes to allow the cheese to melt. When the cheese looks melted and both side toasty, remove from the skillet. Slice and serve.